We recently visited Orlando and met Mikael Audebert, the indefatigable head of Converge Orlando and OrlandoGayTravel.com, a terrific local resource for planning a gay ol’ time in this city of world-famous theme parks and off-the-radar local treasures. 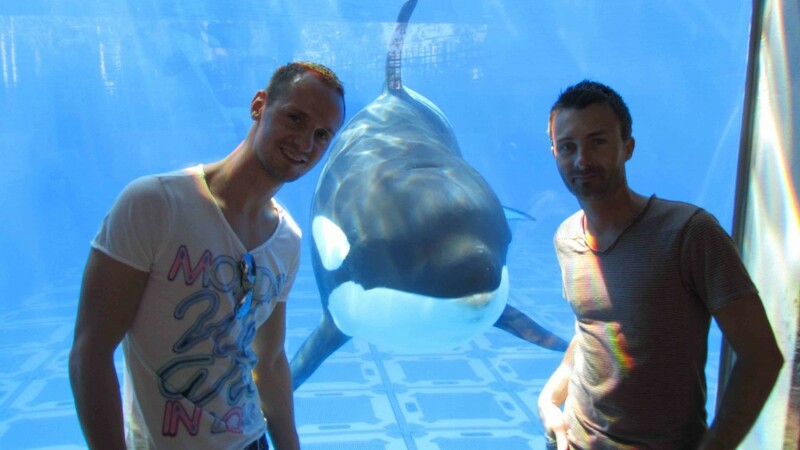 Here he and his boyfriend Mats pose with Trua, one of several killer whales taking part in daily spectacular shows at SeaWorld Orlando. SeaWorld Orlando is one of the several theme parks where being gay and holding hands is A-OK! We visited six parks in four days, kissing, holding hand, and we never heard a single insult once. I loved it! Orlando is a fabulous destination for LGBT individuals all year round. The holidays really have tons to offer. The Christmas show at the magic kingdom was absolutely amazing. To start your planning, download our latest issue and check 0ut all the great insider tips to make your visit to Orlando the best.